Most of these new West Virginians soon became part of an economic system controlled by the coal industry. Miners worked in company mines with company tools and equipment, which they were required to lease. The rent for company housing and cost of items from the company store were deducted from their pay. The stores themselves charged over-inflated prices, since there was no alternative for purchasing goods. To ensure that miners spent their wages at the store, coal companies developed their own monetary system. Miners were paid by scrip, in the form of tokens, currency, or credit, which could be used only at the company store. Therefore, even when wages were increased, coal companies simply increased prices at the company store to balance what they lost in pay. Miners were also denied their proper pay through a system known as cribbing. Workers were paid based on tons of coal mined. Each car brought from the mines supposedly held a specific amount of coal, such as 2,000 pounds. However, cars were altered to hold more coal than the specified amount, so miners would be paid for 2,000 pounds when they actually had brought in 2,500. In addition, workers were docked pay for slate and rock mixed in with the coal. Since docking was a judgment on the part of the checkweighman, miners were frequently cheated. In addition to the poor economic conditions, safety in the mines was of great concern. West Virginia fell far behind other major coal-producing states in regulating mining conditions. Between 1890 and 1912, West Virginia had a higher mine death rate than any other state. West Virginia was the site of numerous deadly coal mining accidents, including the nation's worst coal disaster. On December 6, 1907, an explosion at a mine owned by the Fairmont Coal Company in Monongah, Marion County, killed 361. One historian has suggested that during World War I, a U.S. soldier had a better statistical chance of surviving in battle than did a West Virginian working in the coal mines. In response to poor conditions and low wages in the late 1800s, workers in most industries developed unions. Strikes generally focused on a specific problem, lasted short periods of time, and were confined to small areas. During the 1870s and 1880s, there were several attempts to combine local coal mining unions into a national organization. After several unsuccessful efforts, the United Mine Workers of America (UMWA) was formed in Columbus, Ohio, in 1890. In its first ten years, the UMWA successfully organized miners in Pennsylvania, Ohio, Indiana, and Illinois. Attempts to organize West Virginia failed in 1892, 1894, 1895, and 1897. In 1902, the UMWA finally achieved some recognition in the Kanawha-New River Coalfield, its first success in West Virginia. Following the union successes, coal operators had formed the Kanawha County Coal Operators Association in 1903, the first such organization in the state. It hired private detectives from the Baldwin-Felts Detective Agency in Bluefield as mine guards to harass union organizers. Due to these threats, the UMWA discouraged organizers from working in southern West Virginia. unions be allowed to hire their own checkweighmen to make sure the companies' checkweighmen were not cheating the miners. When the strike began, operators brought in mine guards from the Baldwin-Felts Detective Agency to evict miners and their families from company houses. The evicted miners set up tent colonies and lived in other makeshift housing. The mine guards' primary responsibility was to break the strike by making the lives of the miners as uncomfortable as possible. As the intimidation by mine guards increased, national labor leaders, including Mary Harris "Mother" Jones, began arriving on the scene. Jones, a native of Ireland, was already a major force in the American labor movement before first coming to West Virginia during the 1897 strikes. Although she reported the year of her birth as 1830, recent research indicates she was probably born in 1845. As a leader of the UMWA's efforts to organize the state, Jones became known for her fiery (and often obscene) verbal attacks on coal operators and politicians. Not only did the UMWA send speechmakers, it also contributed large amounts of weapons and ammunition. On September 2, Governor William E. Glasscock imposed martial law, dispatching 1,200 state militia to disarm both the miners and mine guards. Over the course of the strike, Glasscock sent in troops on three different occasions. Both sides committed violent acts, the most notorious of which occurred on the night of February 7, 1913. An armored train, nicknamed the "Bull Moose Special," led by coal operator Quin Morton and Kanawha County Sheriff Bonner Hill, rolled through a miners' tent colony at Holly Grove on Paint Creek. Mine guards opened fire from the train, killing striker Cesco Estep. After the incident, Morton supposedly wanted to "go back and give them another round." Hill and others talked him out of it. In retaliation, miners attacked a mine guard encampment at Mucklow, present Gallagher. In a battle which lasted several hours, at least sixteen people died, mostly mine guards. On February 13, Mother Jones was placed under house arrest at Pratt for inciting to riot. Despite the fact she was at least sixty-eight years old and suffering from pneumonia, Governor Glasscock refused to release her. On March 4, Henry D. Hatfield was sworn in as governor. Hatfield, a physician, personally examined Jones, but kept her under house arrest for over two months. During this same period, he released over thirty other individuals who had been arrested under martial law. On April 14, Hatfield issued a series of terms for settlement of the strike, including a nine-hour work day (already in effect elsewhere in the state), the right to shop in stores other than those owned by the company, the right to elect union checkweighmen, and the elimination of discrimination against union miners. On April 25, he ordered striking miners to accept his terms or face deportation from the state. Paint Creek miners accepted the contract while those on Cabin Creek remained on strike. The settlement failed to answer the two primary grievances: the right to organize and the removal of mine guards. After additional violence on Cabin Creek, that strike was settled toward the end of July. The only gain was the removal of Baldwin- Felts detectives as mine guards from both Paint and Cabin creeks. The Paint Creek-Cabin Creek strike produced a number of labor leaders who would play prominent roles in the years to come. Corrupt UMWA leaders were ousted and a group of young rank- and-file miners were elected. In November 1916, Frank Keeney was chosen president of UMWA District 17, and Fred Mooney was chosen secretary-treasurer. Following the Paint Creek-Cabin Creek strike, the coalfields were relatively peaceful for nearly six years. U.S. entry into World War I in 1917 sparked a boom in the coal industry, increasing wages. However, the end of the war resulted in a national recession. Coal operators laid off miners and attempted to reduce wages to pre-war levels. In response to the 1912-13 strike, coal operators' associations in southern West Virginia had strengthened their system for combating labor. By 1919, the largest non-unionized coal region in the eastern United States consisted of Logan and Mingo counties. The UMWA targeted southwestern West Virginia as its top priority. The Logan Coal Operators Association paid Logan County Sheriff Don Chafin to keep union organizers out of the area. Chafin and his deputies harassed, beat, and arrested those suspected of participating in labor meetings. He hired a small army of additional deputies, paid directly by the association. In late summer 1919, rumors reached Charleston of atrocities on the part of Chafin's men. On September 4, armed miners began gathering at Marmet for a march on Logan County. By the 5th, their numbers had grown to 5,000. Governor John J. Cornwell and Frank Keeney dissuaded most of the miners from marching in exchange for a governmental investigation into the alleged abuses. Approximately 1,500 of the 5,000 men marched to Danville, Boone County, before turning back. Cornwell appointed a commission whose findings did not support the union. A few months later, operators lowered wages in the southern coalfields. To compound problems, the U.S. Coal Commission granted a wage increase to union miners, which excluded those in southwestern West Virginia. Non-union miners in Mingo County went on strike in the spring of 1920 and called for assistance from the District 17 office in Charleston. On May 6, Fred Mooney and Bill Blizzard, one of the leaders of the 1912-13 strike, spoke to around 3,000 miners at Matewan. Over the next two weeks, about half that number joined the UMWA. On May 19, twelve Baldwin-Felts detectives arrived in Matewan. Families of miners who had joined the union were evicted from their company-owned houses. The town's chief of police, Sid Hatfield, encouraged Matewan residents to arm themselves. Gunfire erupted when Albert and Lee Felts attempted to arrest Hatfield. At the end of the battle, seven detectives and four townspeople lay dead, including Mayor C. C. Testerman. Shortly thereafter, Hatfield married Testerman's widow, Jessie, prompting speculation that Hatfield himself had shot the mayor. On July 1, UMWA miners went on strike in the region. By this time, over 90 percent of Mingo County's miners had joined the union. Over the next thirteen months, a virtual war existed in the county. Non-union mines were dynamited miners' tent colonies were attacked, and there were numerous deaths on both sides of the cause. During this period, governors Cornwell and Ephraim F. Morgan declared martial law on three occasions. In late summer 1921, a series of events destroyed the UMWA's tenuous hold in southern West Virginia. On August 1, Sid Hatfield, who had been acquitted of his actions in the "Matewan Massacre," was to stand trial for a shooting at the Mohawk coal camp in McDowell County. As he and a fellow defendant, Ed Chambers, walked up the steps of the McDowell County Courthouse in Welch, shots rang out. Hatfield and Chambers were murdered by Baldwin-Felts detectives. As a result of the Matewan Massacre, Hatfield had become a hero to many of the miners. On August 7, a crowd varyingly estimated from 700 to 5,000 gathered on the capitol grounds in Charleston to protest the killing. Among others, UMWA's leaders Frank Keeney and Bill Blizzard urged the miners to fight. Over the next two weeks, Keeney travelled around the state, calling for a march on Logan. On August 20, miners began assembling at Marmet. Mother Jones, sensing the inevitable failure of the mission, tried to discourage the miners. At one point, she held up a telegram, supposedly from President Warren G. Harding, in which he offered to end the mine guard system and help the miners if they did not march. Keeney told the miners he had checked with the White House and the telegram was a fake. To this day, it is uncertain who was lying. On August 24, the march began as approximately 5,000 men crossed Lens Creek Mountain. The miners wore red bandanas, which earned them the nickname, "red necks." In Logan County, Don Chafin mobilized an army of deputies, mine guards, store clerks, and state police. Meanwhile, after a request by Governor Morgan for federal troops, President Harding dispatched World War I hero Henry Bandholtz to Charleston to survey the situation. On the 26th, Bandholtz and the governor met with Keeney and Mooney and explained that if the march continued, the miners and UMWA leaders could be charged with treason. That afternoon, Keeney met a majority of the miners at a ballfield in Madison and instructed them to turn back. As a result, some of the miners ended their march. However, two factors led many to continue. First, special trains promised by Keeney to transport the miners back to Kanawha County were late in arriving. Second, the state police raided a group of miners at Sharples on the night of the 27th, killing two. In response, many miners began marching toward Sharples, just across the Logan County line. Blair Mountain stands as a powerful symbol for workers to this day. The miners who participated vowed never to discuss the details of the march to protect themselves from the authorities. For many years, the story of the march was communicated by word of mouth as an inspiration to union activists. It serves as a vivid reminder of the deadly violence so often associated with labor-management disputes. The mine wars also demonstrate the inability of the state and federal governments to defuse the situations short of armed intervention. Cole, Merle T. "Martial Law in West Virginia and Major Davis as `Emperor of the Tug River.'" West Virginia History 43 (Winter 1982): 118-144. Corbin, David A. "`Frank Keeney Is Our Leader, and We Shall Not Be Moved': Rank-and-File Leadership in the West Virginia Coal Fields." In Essays in Southern Labor History: Selected Papers, Southern Labor History Conference, 1976, edited by Gary M. Fink and Merl E. Reed, 144-156. Westport, CT: Greenwood Press, 1977. Corbin, David Alan. Life, Work, and Rebellion in the Coal Fields: The Southern West Virginia Miners 1880-1922. Urbana: University of Illinois Press, 1981. Corbin, David Alan, ed. The West Virginia Mine Wars: An Anthology. Charleston, WV: Appalachian Editions, 1990. Jordan, Daniel P. "The Mingo War: Labor Violence in the Southern West Virginia Coal Fields, 1919-1922." In Essays in Southern Labor History: Selected Papers, Southern Labor History Conference, 1976, edited by Gary M. Fink and Merl E. Reed, 102-143. Westport, CT: Greenwood Press, 1977. Laurie, Clayton D. "The United States Army and the Return to Normalcy in Labor Dispute Interventions: The Case of the West Virginia Coal Mine Wars, 1920-1921." West Virginia History 50 (1991): 1-24. Lee, Howard B. Bloodletting In Appalachia: The Story of West Virginia's Four Major Mine Wars and Other Thrilling Incidents of Its Coal Fields. Morgantown: West Virginia University Library, 1969. Mooney, Fred. Struggle in the Coal Fields: The Autobiography of Fred Mooney, edited by J. W. Hess. Morgantown: West Virginia University Library, 1967. Savage, Lon. 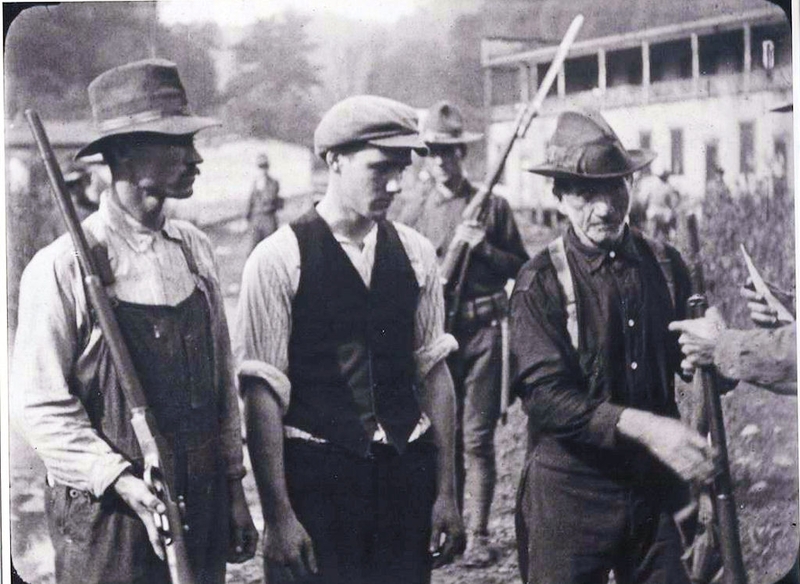 Thunder in the Mountains: The West Virginia Mine War, 1920-21. Pittsburgh: Univ. of Pittsburgh Press, 1990. Scholten, Pat Creech. "The Old Mother and her Army: The Agitative Strategies of Mary Harris Jones." West Virginia History 40 (Summer 1979): 365-374. Sullivan, Ken, ed. The Goldenseal Book of the West Virginia Mine Wars. Charleston, WV: Pictorial Histories Publishing Company, 1991.